I wouldn’t usually write about something just because I had finished it; I finish things every day and then I go out and buy new things, or dig into my bottomless pit of things that I need to test. At the moment I’m judging about a million beauty products for the Zest Smart Beauty Awards and so it’s all a bit chaotic in the AMR office, but from the pit of despair, I managed to rescue this empty pot of Clarins body cream. 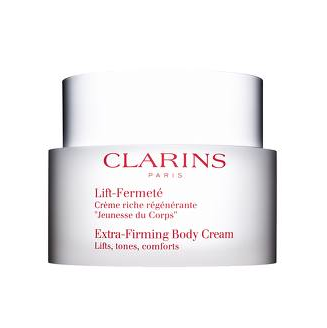 I had been saving it to remind me to write a recommendation for it – it’s one of my favourite Clarins products. This Extra-Firming Body Cream has a good strong texture but isn’t anywhere near as solid as a body butter. I like a body butter, but I find them quite hard work sometimes. 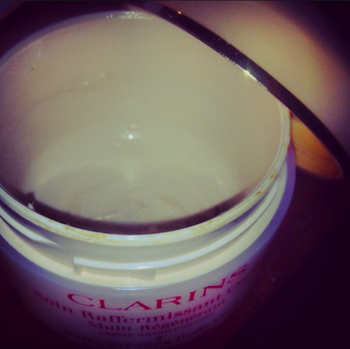 The Clarins cream slips on easily and feels thick and nourishing without being a total pain in the arse to rub in. It’s not highly fragranced, it’s not greasy, and applied before bed it’s a surefire way towards extremely soft skin in the morning. Firming-wise, I’m not sure. Can it lift? I doubt it, but if you enjoy using it and apply it regularly, the repeated massaging action could have some effect. Toning and comforting, definitely. The pot I’ve just finished was from when I had stockpiled a load of it during a particularly good “Gift With Purchase” season, but I see now that the skanky apricot-coloured packaging has been shunned in favour of bright, clinical white. I like it – it’s less eighties, therefore less nostalgic for me, but it looks good on the bathroom shelf. Crikey! I’ve just seen the price – £40! Has it always been this much? I’m sure it wasn’t that much last time I bought it. It’s up there with the best, I think, when it comes to effective body moisturising, but if you’re looking for something more scented and luxurious then see also the Emma Hardie body cream and Decleor’s l’Age Youth.